I used my Audio-Technica AT4047/SV large-diaphragm FET condenser mic. This is one of their “vintage-style” mics; I suspect the “47” in the model number is meant to imply that it sounds like an old Neumann U-47 (also a solid-state FET mic). I’ve never compared them, but suffice to say, it’s a relatively warm-sounding mic, which is a good thing for my nasal voice. This went into my Langevin Dual Vocal Combo, a now-discontinued piece of hand-wired, made-in-the-USA loveliness from the same folks that make fancy Manley tube mics and outboard gear. The “DVC”, as it’s known, features two discrete transistor mic pres, two opto compressors and two basic EQ’s. It’s flattering on just about anything that’s run through it, and you get away with some pretty serious vocal squashing before undesirable compressor artifacts become audible. The downside was the steep price, but it’s money well spent, and besides, high-end outboard gear holds its value nicely. Handsome, no? Once lead vocal tracking was completed, I inserted a GSnap Pitch Correction plugin on the channel strip and set the key to A# major. Without delving into a debate about the ethics of vocal tuning, I almost always use a mild amount of pitch correction to tidy up vocal performances. I find the speed control to be the most significant – fast speeds are more effective for fixing up singers with poor intonation but can quickly make performances sound robotic. Conversely, slower speeds take longer to “catch” off-key notes, but sound much more natural. Here it’s set to 16 (on a scale of 1-20), so it’s pretty slow. 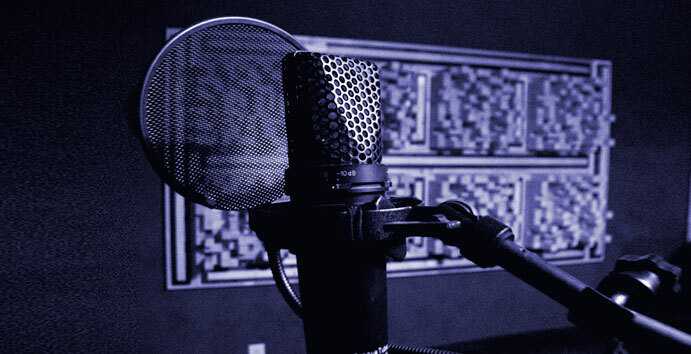 In most pop and rock songs, it’s desirable to compress vocals quite a bit. As a quick refresher, compression evens out dynamics by making loud passages quieter and quiet passages louder, making it easier for the vocal to ride on top of the mix. The downside is that a poor-sounding compressor can impart artifacts, usually of the “pumping” variety. Pumping usually refers to obvious dives in volume on loud notes or exaggerated breathing noises (listen to Steve Miller’s “Jet Airliner”). Sometimes these effects can be desirable, but typically, transparent compression is desirable. An effective method for achieving a nicely “squashed” vocal is to track through a quality hardware compressor and then add additional compression with a plugin. After tracking and comping my lead vocals, I inserted a Kjaerhus Audio Classic Compressor. I used a basic vocal preset, but ideally you want a fast attack time (so the compressor starts squashing right as notes are hitting it) and a medium ratio (somewhere between 2:1 and 4:1). 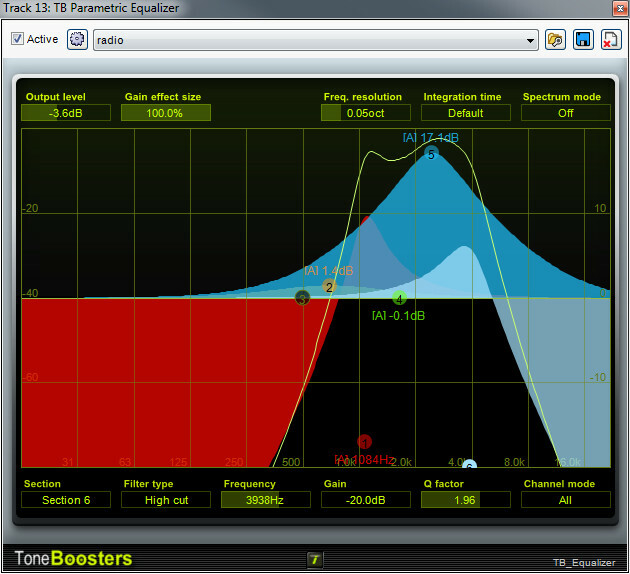 The most important setting is threshold, which determines how much actual compression occurs. You have to use your ears to set this, but this control usually operates in reverse – i.e. all the way up is no compression. As you dial the knob back, the compression level increases. The best way to set vocal compression level is to slowly dial it back, and watch the reduction meter (if available); 2-4 db’s of gain reduction usually works well. In the case of Kjaerhus Audio Classic Compressor, there’s simply a reduction light which should turn on and off as peaks hit. If the light is solid red, you’re compressing too much, but you’ll probably hear the pumpy mess of audio before you notice the light. Often I’ll add an EQ, but in this case it sounded fine without it (depends on the song, vocalist, mic, etc.). If I do add EQ, it’s usually to remove frequencies below 200 Hz and add a little high-shelf lift around 8000 Hz for sparkle. I’ve also found the area around 2000-4000 Hz important. This is the infamous “icepick” region where your ears are very sensitive, so dial back frequencies in this area if the vocal sounds harsh in the upper-mid frequencies. Just don’t go too nuts or you’ll lose intelligibility. Next I added a send channel in order to bus the vocal to an Acoustica Pro Studio Reverb. Not only does this let me send my inherently mono lead vocal to a reverb that outputs a stereo signal, it also allows me to send multiple tracks to the same reverb instance, thus saving processor power. To create a send channel, select Track>Insert Track>Send Track in the Track menu at the top, then insert Acoustica Pro Studio Reverb into the send track channel by clicking on the FX button (you can do this from the channel in the arrange window or in the mixer window). Once the reverb is inserted, adjust the send level with the red knob at the top of the mixer window. (if you’re using multiple send tracks, make sure you’ve selected the correct send channel in the pop-up menu at the top left of the mixer) I set the send level to 68, but this isn’t critical, just use your ears ’til you like what you hear. I recommend setting reverb levels with the entire mix playing because the reverb will sound overly wet when a channel is soloed. Regarding the reverb settings, the only critical setting is the time, which you can see is around 2.4 seconds. That’s a pretty long reverb, but I was going for a pretty big and murky sound. You certainly wouldn’t want reverb this heavy on an in-your-face pop kind of vocal. I usually like big reverbs to be pretty dark – in this case I dialed in some high-frequency reduction using the filter controls. Remember to set the output mix to 100% wet when using effects on a send channel, because the dry signal will already be present on its own respective mixer channel. After tracking all the backing vocals, I created a submix channel for them. This means that all tracks present in the submix channel run through a common “master” channel, letting you have a single master volume, pan, EQ, insert effects, etc. It also lets you mute all the backing vocals with one mute button click, which is real handy when working on other parts of a mix. To create a submix channel, select Track>Insert Track>SubMix Track from the Track menu at the top, or click the +Track button at the top left and select Add SubMix Track. Once the submix track is created, simply grab the tracks you’d like to move into the submix group directly beneath their track name and drag each of them under the submix track. With the submix tracks set up, I added a Kjaerhus Classic Compressor. This is referred to as “bus compression”. The idea is to process all the backing vocals using a single stereo compressor; this has the effect of gluing the separate tracks together for tighter and more cohesive backing vocals. This particular song doesn’t have tons of backing vocals, but you can really hear the effect of bus compression when you’ve stacked up many layers of backing vocals. I typically quadruple-track each harmony line if I’m doing a pop song, but because this track has a more indie rock vibe, I just doubled each harmony and hard-panned them left and right. 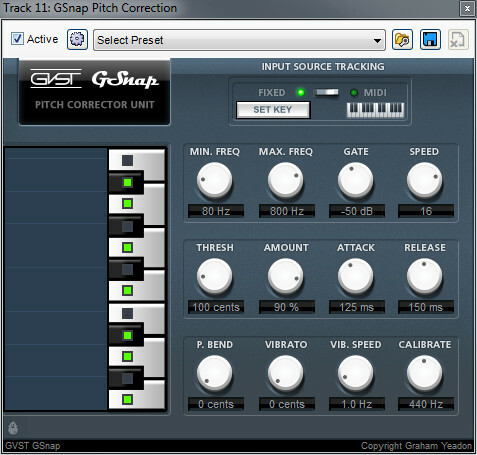 As with the lead vocal, I inserted a GSnap Pitch Correction plugin, set to the key of A# major. You’ll need to insert a separate pitch corrector for each vocal channel – don’t insert a single pitch corrector on the submix channel, because pitch correction plugins expect a single monophonic audio single (i.e. one singer singing); multiple voices will confuse it. For the outro section, I was trying to create a tapestry of melodic interplay between the lead and backing vocals as well as the lead synthesizer melody. For parts like this, I’ll often get an idea of how I want the words and melody to flow, then I’ll try to come up with lyrics to fit the idea. In other words, “the more it changes, the more it stays the same” lyrics are almost secondary to the actual musical idea. Once I had the melody for that, I started fooling around with harmony ideas and quickly determined that the harmony sat in the hideous-sounding nether region where my head and chest voice converge. Lucky for me, my live-in girlfriend is a pro singer, so female backing vocals are as easy as yelling down the stairs (and getting a lot of weird looks while she attempted to match my weird, draggy phrasing, but she did a great job). I added reverb using the existing send channel instance of Acoustica Pro Studio Reverb. You’ll notice I dialed up the send knob for each individual backing vocal track, but looking at it now, I could’ve accomplished the same thing by using the send knob on the submix track (in this case it was superfluous, but using separate channel send knobs does let you decide how much effect is desired for each vocal track individually, should the need arise). First I used a low cut filter set at 1084 Hz, which lops off all low and low-mid frequencies, then a bell filter at 705 Hz with a +1.4 boost (honestly, that was probably accidental, but I didn’t want to ignore it in case anyone is double checking my EQ settings! ), another bell set to 2469 Hz with a crazy +17db midrange boost and finally a high cut filter set to 3638 for lo-fi effect. For my final trick, I added a doubled harmony around bar 57 on the words “just can’t” and put a large repeat echo on the word “can’t”. First I tracked the the vocals and panned them hard left and right. I then added a GSnap Vocal Correction to each channel (can you tell I’m really hot to trot on vocal tuning?). To echo the single word, I created a send channel and inserted an Acoustica Delay plugin. I recommend naming the send channel something descriptive; in my case I called it “Just Can’t Echo”. The secret to echoing a single word in a line is to automate the amount of signal being sent to the delay, not the volume of the effect itself (i.e. its send channel level). Here’s why: if you set the send knob to one level, then automate the volume level of the delay send channel, you’ll here everything that’s recently happened, resulting in a hodgepodge of the entire sentence. Conversely, if we leave the delay’s send channel at a constant volume, and automate the level of the send knob, we can bring it up very quickly from zero to “full blast” for single words, resulting in a single echoing word (or words, depending on how you draw the automation). 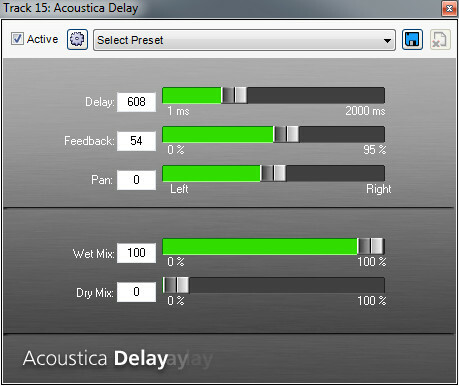 The delay time is set to 608 ms, which (I’m pretty sure) results in a dotted quarter-note delay. Truthfully, I probably just mucked with the delay time until it sounded like what I heard in my head, but you could use Mixcraft’s Kjaerhus Audio Classic Delay or Dubmaster Liquid Delay if you wanted to simplify the tempo-synced delay experience. In the audio clip above, the first half is the word “just” (where I didn’t want delayed), and the second half is “can’t” (which I want delayed). The automation curve on the bottom controls how much signal is sent to the delay – you can see how the curve quickly rises at the word “can’t,” then gradually falls back to zero. In this case, bringing the send level back down is trivial because there are no other audio clips on the track, but if you want to effect single words in a continuous vocal track, you need to make sure the send level rises and falls as necessary. That about covers it. Next time I’ll briefly discuss how I mixed and mastered it, then I promise to stop writing an entire blog about one song… in the future we’ll talk about delicious gelato, fat shoelaces, and that time I went to the zoo.